Excerpts from The Complete Yorkshire Terrier by Joan B. Gordon and Janet E. Bennett The Yorkshire Terrier is usually born black with tan-points, the tan being on the following places: on the puppys muzzle; above each eye; base of ear; ear rims; inside of ear; underside of tail (extending midway out from body on uncut tail) around the vent and edge of breechings; on the outer side of forelegs, feet and a small way up pastern; on the inside of the forelegs extending from armpit slightly onto the chest wall. There is tan on the outer side of rear legs, on paws, and partially up pastern; a fine line extending up to stifle on front; and part of hock on rear side. The inside of the hind leg is tan except for a small blackish 'V-shaped' patch on each upper inside thigh joined by a black bridge across the pelvic arch. The rest of the underside, except for a black girth around the rear chest and brisket, is tan. The underside of the jaw (though there may be a black patch in the middle of the underside of the lower jaw) and the underside of the throat is tan. The fore chest has a rosette at each shoulder point, or a horizontal stripe between them in the black. The tan on a young Yorkie puppy is a light pale golden tan to a dark rich golden tan. All tan marks may be more or less in extension. They may be perfectly delineated from the black, or be slightly intermingled with blackish hair. There may be a white star or a small blaze located on the fore chest in the tan, or across the black and tan. This is a much looked-for point, as it is an indication that the puppy will probably be a good coat grower in quantity, though not necessarily in quality. It is also an indication that there will be no melanism, or over-supply of pigment. It is not unusual to find small white marks on one or more toes, or a fine white line on lower forjaw. These will not be visible as an adult. Any such marks should therefore be noted wherever you keep such records, as one is apt to forget which puppy had them after they grow up. A large amount of white marks, on chest, paws, jaws or skull, places a Yorkie into a tri-color classification and it is very wise to guard against this possibility. The newly-born Yorkie has a nose that is mostly gray, showing a small amount of pink on the edges of the nostrils. The nose should be a dark gray at around 21 days and definitely black by two months. It is very unusual to see a mismarked nose in a Yorkie and it should be considered a very bad problem. The toenails are gray at birth, with an occasional white one. Any that fail to become black by two months are indicative of the availability of non-pigmented skin and hair. The eye rims will be a light reddish-brown to reddish-brown at birth, but should be a dark red-brown by two months. Very orangy red-gold tans will usually have lighter colored eye rims. This is not particularly desirable, but a sad fact of life. Unfortunately it also spoils the eye;s expressions. 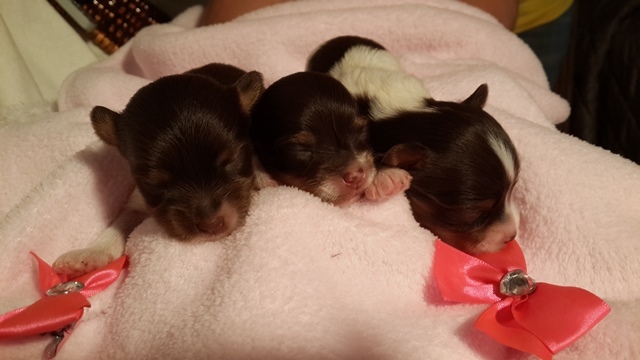 Yorkshire terrier puppies can be born of colors that automatically deprive them of the necessary qualities to become the proper colors of the breed. They can be born all black; all tan; tan with black-points, tri-color;: black, white, and tan; all blue; bluish grey with tan-points, and so remain or change to another shade of their newly-born colors. The transition from newly-born puppy to adult Yorkshire terrier is a very confusing period. Any attempt by a novice to come to grips with this period by reading opinions of Yorkie breeders can only add perplexity to confusion. No one agrees. This fact alone offers the greatest hope to any breeder. The answer lies in the fact that a bloodline generally follows a course, but it never holds entirely true for all members of the bloodline. Each Yorkie puppy commences its transition from the newly-born black-and-tan to the adult blue-and-tan by its own inherited and constructed glandular system. The combination of its inherited genes from its' sire & dam at conception, and the development of the fetus into a thriving new born puppy, determines the health and makeup of the glandular system that supplies the pigment for the hair, skin, eyes, eye rims, nose, and toenails. The black tan-pointed, newly-born puppy must change into an adult with a pure clear golden tan and a pure even dark, steel-blue. Not all puppies achieve this goal. Some fail because their coat texture is unable to provide a means for light rays to be refracted and reflected to the human eye. Others fail because their systems fail to provide the necessary amount of pigment particles to the hair strands. Some fail because they inherit incorrect pattern placements. No matter what the cause, the result is that the Yorkie is unable to visually match the standard in desired colors at specific areas. To correctly match the standard the Yorkie puppy must remove all black or blackish-brown hairs from its golden tan. This is first noticed on the skull which may go from black to tan at the hair roots, with any new outgrowth of hairs being tan. Or the hair on the skull may go from black to gray, with roots almost white, and any new outgrowth a very pale weak tan. In this last case as the black intermingled hairs diminish the roots and new outgrowth will gradually assume a richer golden tan. The black on the muzzle, sides of head, front ear-base and around the eyes generally achieves a richer golden tan at the roots and new outgrowth as the black intermingled hairs diminish. These areas are always a darker shade of golden tan. The chest and legs follow the same program as the skull. All early tan marks are always a richer tan. In the case of a very light pale golden tan (creamy colored) there is usually no distinction between these early tan marks and the newly grown tan hairs. The rear of the ear leathers are the last to surrender from the blackï¿½s hold. They should be a deep rich tan minus any blackish hue. Failure of the ear to achieve a dark golden tan from the puppy black is very indicative of a Yorkie who will never clear its blue or clear its tan of black-hued hairs. The newly-born to adultï¿½s skin pigment is identical in color transition as the outgrowing hairs. 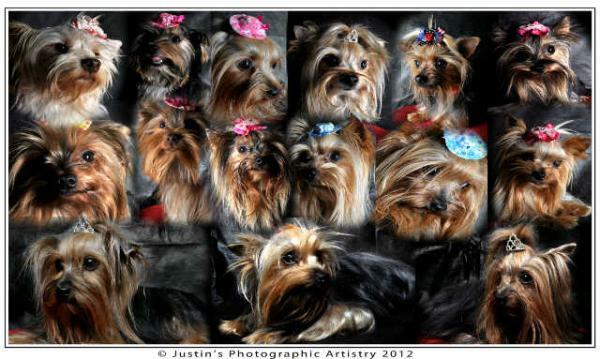 The greatest block to a Yorkies complete assumption of the desired colors is the failure of the coat texture. The newly-born puppies have flat, smooth, short-coated hairs. Only as the hair grows can texture be felt. It may be wiry, woolly, cottony, or silky. A wiry coat can develop the visually correct colors, but it will not attain great length. Most wiry coated Yorkies do change coat texture prior to one year. The hair at the roots commences to grow out a finer grade and thus becomes silky. The puppies with woolly and cottony coats, although growing great length and heaviness fast, never attain the correct visual colors. Their qualities ' thick heavy, downy, and soft' deter or dull any light rays from proper play on the hairs. Wavy coats are visible in Yorkie puppies at a very early age and in general portend a light silver adult. A slight waviness on the upper hindquarters is not unusual in many Yorkies, but should be watched. 'Breaking' Patterns As no two Yorkies ever seem to follow an exact transition pattern, or 'breaking' as it has come to be termed, we have included the most general facts of this trying time: A puppy that is about 3 to 4 weeks of age that shows gold hairs on the top of its head when the black hairs are parted, will as an adult have a clear golden tan. If the coat texture is silky, the blue will have no intermingled colors. A puppy that has a wiry coat texture, with a tan that is a very bright red gold by four to five months, will as an adult do one of two things: First, if the puppy as it approaches five or six months, or at least by nine months, shows the transition from black to blue, the coat texture will soften to a silky texture. If the black coat does not show this transition to blue, the adult dog will retain the wiry coat which will never attain any great length. A puppy that has a bright orange-red tan by four or five months, will as an adult have a bright steel-blue, which may have areas of lighter or darker blue. This coloring shows the greatest tendency to have the tan placements run into the allotted areas for the blue. The texture will be silky. A puppy whose coat appears sparse or thin will, as an adult, have a thick, long coat of the correct fine silky, glossy texture. This coat's growth is like a human's hair, in that it is born with very little but by adulthood has an abundance of hair, the quantity having doubled and redoubled all during puppyhood (or childhood). Both colors will be totally clear. A puppy of around four months, that has changed the color on its head from black to gray to a very pale sooty color, will as an adult enrich all the tan areas to a clear golden tan. The blue will follow the correct manner of transition from black to blue starting to do so around six months. The coat texture will be the correct silky type. A puppy whose tan has been cleared of all the intermingled black or sooty hairs by four month age, and whose texture is fine and silky, will as an adult have correct colors. The tan of this puppy will probably enrich to a darker shade as an adult. A puppy approaching adulthood with a thick heavy coat that has pale cream colored legs, sooty head colors, with intermingled black hairs in tan at sides of hear and on the ear and ear fringes, may as an adult diminish some of these black and sooty hairs. Its desired blue area may eventually achieve a transition from black to grey but it will never have a clear golden tan, or a dark steel-blue. The coat texture is either a wooly or cottony. A puppy approaching adulthood that has a black stripe in the center of its head, intermingled into the whiskers, sides of head and up into the top-knot, with ears that are move visibly black than rich dark golden tan, will as an adult have a tan that is never totally cleared. As the years pass some of the black and sooty hairs will diminish, but a check of the pigment under these intermingled areas will show that it is a dark gray which will never lighten. The black on this dog will show a few hairs that will some hears hence go from black to gray, especially at the lower hips and lower shoulders, when the hair is parted down through the upper layers. The coat texture will be woolly or cottony. A puppy approaching adulthood that has intermingled sooty or black hairs art the sides of its head running up into the top-knot, with a sooty area between the eyes, and who ears are a sooty tan, will have a gray body coat by around three years. The gray will be lacking a blue hue. The tan will always have some intermingled sooty hairs especially at sides of head, ear fringes and between the eyes. There may be some black or sooty hair on top of the muzzle but not in the foreface furnishings. The coat texture is cottony. A puppy of three to four months that has a very pale gold tan and whose black has gone to light silver-blue, will as an adult be a light silver-blue. A check of this puppy's pigment will show that it is incorrect, as it will be light-gray flesh color. The texture will be silky. A puppy that shows coarse white hairs intermingled in the blue will usually shed most of these as it approaches adulthood. A puppy approaching adulthood, (or over a year) that has an inch wide stripe from the hair root out, then blue, with the tip and last inch or two still showing its transition from black to blue, will with age lose the blackish tips on the end as they are worn off or cut off as the coat achieves floor length. The dark stripe will remain although it may be lessen in width. It shows that the pigmentation of the hair is extremely dense at its beginning and does not diminish until it reaches this point. The tan will be clear, and the coat texture silky. A puppy that at some stage in its puppyhood shows a brownish cast to its blue or black body coat is passing through a stage in which there is a hormone imbalance. This condition will normally right itself, as it is purely a growth stage. All these are generalities and any puppy may follow a different path. How the Color Is Acquired The underlying skin has pigmentation of the same color hue as the hair. The head, chest and legs have skin pigment that is light yellowish pink to moderate reddish, orange-yellow. The inside of the ear is the same, but the outside pigmentation of the ear leather is a reddish brown. The body's skin has a pigment that is a light grayish-blue to medium grayish-blue. The pigmentation on top and sides of the tail is medium gray-blue to dark gray-blue. If the skin is injured, the hair scratched or torn out, the healed skin with the early hair growth will be a darker area until it returns to normal. Very bluish-black, or dark grayish-black, skin pigment will have hairs that are black or less heavily-pigmented grays.